This latest issue of Talking Crochet has a funny "tail" written by a fellow crocheter. I think you'll LOL when you read it. There is also a review of two new books, Delma's Diagonal Stitch and Quick-to-Stitch Prayer Shawls. I've added the Pray Shawls book to my "purchase soon" list. I'll donate it to my Prayer Shawl Ministry, as another source of patterns for everyone. It will also give me another chance to remind them that they can't copy patterns from books and pass them around freely. There is also a nice calendar of up-coming crochet/fiber events. Our local Guild is planning a day trip to Stitches East in Baltimore. You can get more information from the link in the newsletter. To subscribe to the newsletter, check out the above link. From this site, you can also subscribe to several other newsletters in which you might be interested; newsletters on knitting, sewing, quilting and other crafts and hobbies. I found the Quilting Color Magic to be helpful in selecting colors for crocheted afghans. I couldn't wait, I told you I needed more photos! 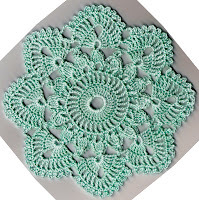 This is called Posh Pineapple and is from the Leisure Arts booklet entitled Pineapple Doilies. I'm on round 12, and it's a whopping 4" across. I work and work and feel like I'm making very little progress. I don't know about the rest of you, but I'm getting bored with this blog lately. I want pictures! Here's a picture of the motif Crochet-a-Long for September. 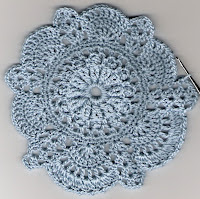 It's called Ring of Roses, and you can find the pattern on the "Celt's Vintage Crochet Site". Maybe tomorrow I'll add a photo of the doily I'm currently working. Here's a great article about a group of young men who want to share their crochet knowledge, and help the save the world. They've combined these goals with an interesting non-profit group. Oh, to be young and idealistic. Oh, to change the world with crochet. Can we sign up somewhere? I went to the Gratz Fair tonight, and it was a beautiful night to be at a Fair. Walked around & ate "fair food", and looked at all the agricultural stuff, also the stuff for sale, like jewelry. In the Arts and Crafts building, I enjoy looking at the artwork - especially the drawing, painting and photography. The needlework entries seem to be getting fewer and fewer each year. I looked at the knitting, crocheting, and quilting, I didn't see anything that was really exciting. Well, except for all of Margie's freeform, but I'd seen those items already, at the CGOA meeting. I usually see at least one afghan or quilt that is spectacular, unique or inspiring. Last year, one of my doilies placed 2nd and at first I asked myself "what more could they be looking for?" Then I looked at the 1st place winner, it was a large doily, done with white #30 thread, mounted on dark blue paper and framed. It was an exquisite work of art. I bowed in homage to the work of the "Thread Queen". Tonight, the first item of mine that I saw was the pink doily (see my entry of Aug 25). It had a second place ribbon. Now this doily has all kinds of interesting stitches, like front post trebles, and split front post singles! If this placed second, the "Thread Queen" is still around, so I looked for her 1st place doily. 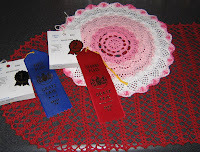 Imagine my surprise, the oval doily that I made in burgundy #10 thread was the 1st place winner. This pattern did use only basic stitches, but it took a lot of concentration to keep the pattern working correctly. I don't think I have a picture of it on the blog, yet. Will have to get a picture after I bring things home. My scarf placed 1st. It was done with Tunisian Simple Stitch and a novelty yarn. The Baby afghan placed 3rd, I'm not too surprised at this. It was done in Tunisian Knit Stitch, and I sometimes think I should stick to "classic" crochet if all I'm looking for is the ribbon. But, this afghan is so pretty, I really hope to inspire someone else to try Tunisian. But anyway, it was done in Knit stitch, with a purl border, so it looks more like knitting than crocheting. It was also a diagonal, or corner-to-corner design, and it tends to "bias" or slant to one side. It's impossible to fold this into a nice square. So, overall, I wasn't expecting it to place well again classic crochet, but it was my original design, and it placed 3rd. It's all good! Tuesday, during my free period at school, I started my swatch for the CGOA Membership group Stitch of the Week. I could have been grading papers, that's what several other teachers were doing, but a little crochet break keeps my head together on a long day. Anyway, I tried the stitch pattern with worsted weight, and it's an unusual pattern. I like the look, but I don't think it shows well in worsted, and it's very bulky. I want to get some solid sport weight and try it again. In the meantime, on Monday they posted the next stitch. I hope to get to that today, maybe before tutoring, and a trip to the fair to see how well my enteries did. Both our girls left this morning for their next job, they're working together for the first time professionally (not as college students). I have to do some major cleaning in both bedrooms, as I store yarn, thread, patterns and works in progress in those spaces! Would like to give them more space and have it better organized before they come home again. Back to the swatches, maybe I'll have some interesting pics to post soon! Dee has thrown down the gauntlet and issued a challenge. If you're familiar with the movie Tap, everyone now yells "Challenge!" I supposed few others know the movie, therefore instead of yelling challenge, we need to pick up our hooks and crochet a scarf and donate it to a charity. The charity is your choice; a local nursing home or veterans organization, or a national group, such as the Orphan Foundation of America. They are looking for red scarves, your choice of pattern, stitch, yarn, etc. and Christmas on the River. This group is asking for scarves, hats,mittens and socks, and have a nice list of patterns available on the site. "Survivors Offering Support" This yarn shop in Maryland is packing goodie bags to give to women recently diagnosed with breast cancer. They are looking for Pink scarves. "The National WW11 Museum New Orleans"
"Knit your Bit" This museum has a pattern which evokes the 1940's, which is available on the website. I think crocheters asked for a pattern, and a knitter translated the knit pattern to crochet, because it's a real laugh! Here's the beginning: "Chain approximately 6 inches in MC"
then "switch to CC and crochet 1 inch, change back to MC and crochet 1 inch"
I wonder what stitch we're using in this pattern? But the best is probably the final instruction "BO all stitches". Beginning crocheters, don't try this pattern without help! I have two red scarves finished to mail to the Orphan Foundation, and one to go to a local charity. I think I'll make one or two to send to the WW2 Museum, but I think I'll have to buy some olive green or navy blue yarn. Try surfing the web to find other charities looking for scarves, and find one you want to support with your time, yarn and hooks. "Whole lotta swatching goin' on". Okay, Jerry Lee Lewis is in my head singing "Whole lotta swatching goin' on". It's not pretty, but it won't go away. I've been busy with swatches still. I entered a scarf in the county fair, of course I hadn't made it yet. I bought some pretty new yarn and swatched all kinds of stitches, classic crochet & Tunisian, nothing jumped out at me. I made a skinny fashion scarf, my daughters didn't like it, but the ladies at the Sit N Stitch thought it made a pretty cool belt. Back to swatching, changing colors and yarns. Daughter #2 had a vision of a diagonal scarf, in blue and brown. She selected very 60's colors. I wasn't feeling it, but tried to produce her vision. After several attempts and several times being told "You're still making vertical stripes and I want horizontal diagonal stripes" I grabbed graph paper and colored pencils. I thought I finally had it, and went back to crocheting, I still had it going wrong. I kept saying "If you turn the paper 180 degrees, I've made what you said". But no, they insisted that I had to turn the paper 90 degrees. So I turned the graph paper and started again, still not right! I don't know when it finally clicked, but I finally got horizontal diagonal stripes. Only I created a long thin block with a sharp diagonal. She was envisioning a "softer diagonal" that's not the mathematical term I'm looking for! But, I went back to the graph paper, scribbled a litte more over my sketches, made notes, and created a chart, and finally got the diagonal stripes the way she wanted them! I've now run out of time to get these to the fair! Hubby suggests that I must have some scarves somewhere in the house that I can take. He's right, I have several tucked away to send to the Red Scarf Project, and several for displays at Michaels. I've selected a pretty black novelty yarn with lots of blobs of colors, done in Tunisian simple stitch. I'm off to deliver things to the fair. Next, I want to swatch the Brush Stroke stitch pattern that was the Stitch of the Week (SOW) at the CGOA Membership group this week. It's an interesting looking stitch. And Monday, we get a new stitch. Can't get too far behind on this, or I won't get a chance to add to the discussions. I've spent most of this week trying to go to many different directions. School started, so I have lesson plans, homework, syllabus, and all kinds of paperwork to do. Also, I have 4 students that I'm tutoring. Then our girls are both home for a few weeks, then they're on the road again. So, I'm trying to spend time with them,...shopping, card garmes, discussing books, music, plays, etc. Crochet-wise, the county fair starts next weekend, I need to have my entries ready by Friday. I realized that this would be a scramble, so I only entered 4 items this year, 2 doilies, a scarf, and a baby blanket. The doilies were completed, the blanket about half-finished, so only a scarf. I can whip one up in a few hours while watching tv, usually. Friday, I got a call from my LYS, the soy blend yarn that I ordered had come in, so on Sat. I drove up, and while there we discussed choices in quality, non-animal fibers. The owner had a new fiber to recommend, it's Berrocco Comfort, a nylon, acrylic blend. Think soft as Micro-spun without the splitting! I selected 3 colors that I liked together with plans to make my scarf with these. Well, I've been swatching for 24 hours, some Tunisian, some classic crochet. I love the fiber, and promise a full review for the blog, and the CGOA membership group. I finally selected a simple stitch, working lengthwise, so that it's all about the fiber and colors. I have plenty of yarn left over, so I'm thinking of doing some chemo hats with the rest, but may play around to come up with another scarf. Now, I need to focus on finishing up the baby blanket. Although, I have the urge to try a round ripple. Do I have time? Let's make this entry short and sweet. Check out the crocheted desserts at the above link, Cake Sachets. Oh, the yummy chocolate cakes, whipped cream, raspberries, blueberries, strawberries,.. oh the dripping chocolate syrup. I've spent a lot of time decorating cakes, and the details are very authentic. Try to select a favorite!